It seems like everyone wants to learn more about tsunamis. Yes that included me especially after watching the one hit Japan the other day. New Zealand and most other countries on the Atlantic fault line had tsunami warnings and I must admit I watched the movement of the waves with some degree of trepidation. We were very lucky and the waves that hit were minimal. I must admit I also watched the live cams on Hawaii and their neighbouring islands as they are closer than we are and I believed this would give me an indication of what we were to expect. I knew we would get smaller waves than them so when there waves weren’t that bad it was time to relax. Sadly New Zealand has no warning systems in place like most other countries do though were finally going to get our first ones along the top of the North Island. If there is a Tsunami warning please get as far away from coastal areas as you possibly can. If there is a hill or mountain head towards it as getting higher up could save your life. The tsunami in Japan travelled 20 miles inland so getting away and getting high can save your life. 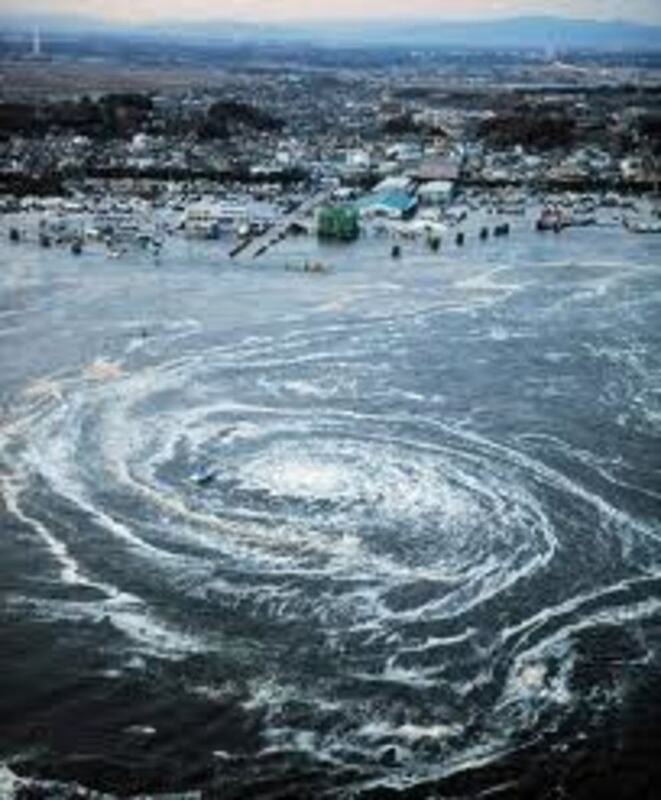 The word tsunami is a Japanese word, It is translated as "harbour wave". The word tsu means harbour. The word nami means wave. Long ago Japanese fishermen created the word tsunami. They would return from the sea to find that their villages had been destroyed by large waves. 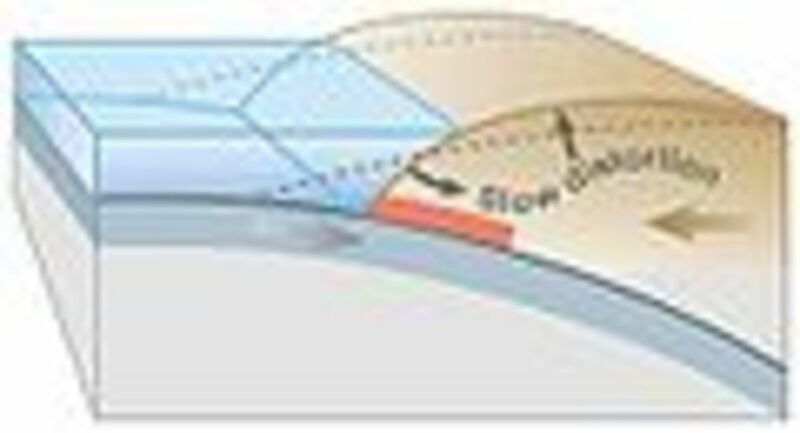 Normal waves break and move water in a circular motion. Tsunami waves just go forward so this sends the entire wave inland at high speed. 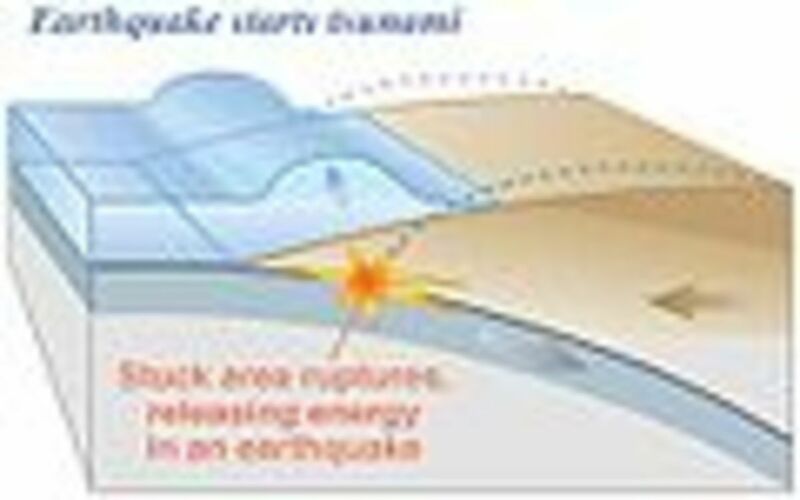 Tsunamis are mostly caused by underwater earthquakes. 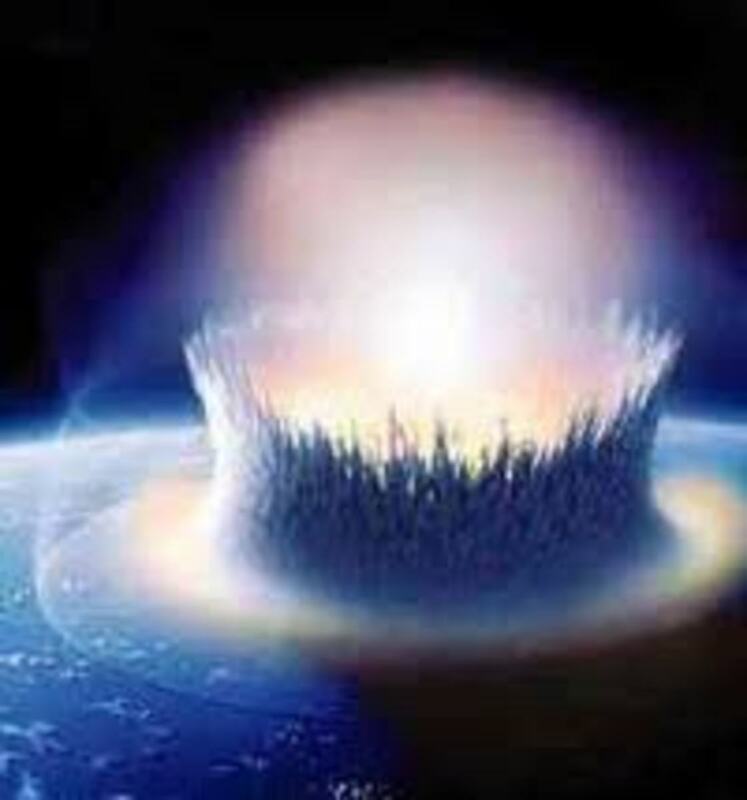 They can however be caused by landslides into a body of water or asteroids landing in the ocean or another body of water. 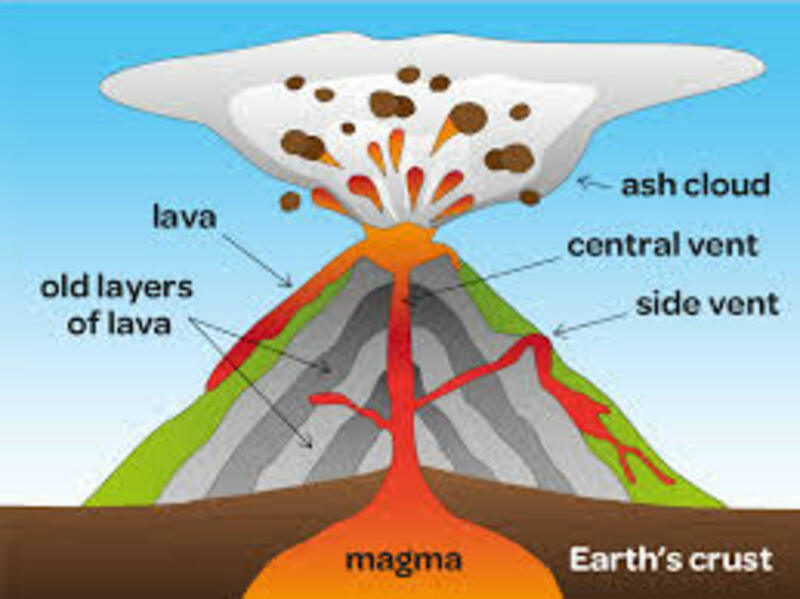 They can also be caused by erupting submarine volcanoes sending magma into the water. Any of these things will cause the water in the area to be violently pushed up and away from the site of impact. Each cubic metre of water weighs a ton. 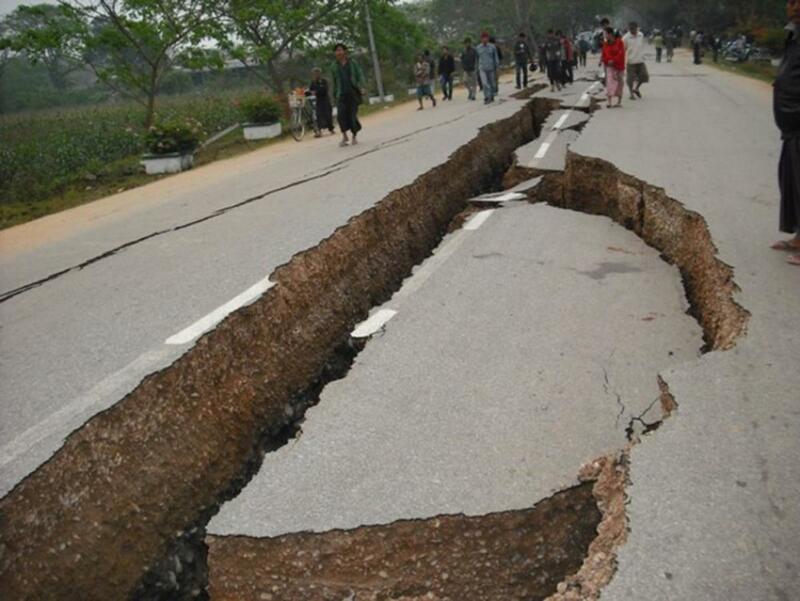 Tsunamis can travel thousands of kilometres before reaching land. However when they do reach land they can be devastating. 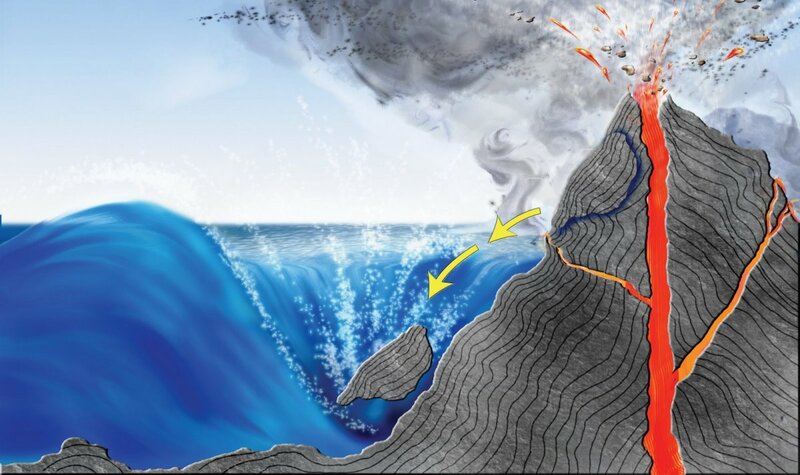 Tsunamis occur most often along countries which border the Pacific plate also known as “The Ring of Fire" or "The Rim of Fire". This area is well known for both seismic and volcanic activity. The Ring of Fire is about 40,000km long. Tsunamis can travel through deep water as fast as 950 kph or 590 mph. 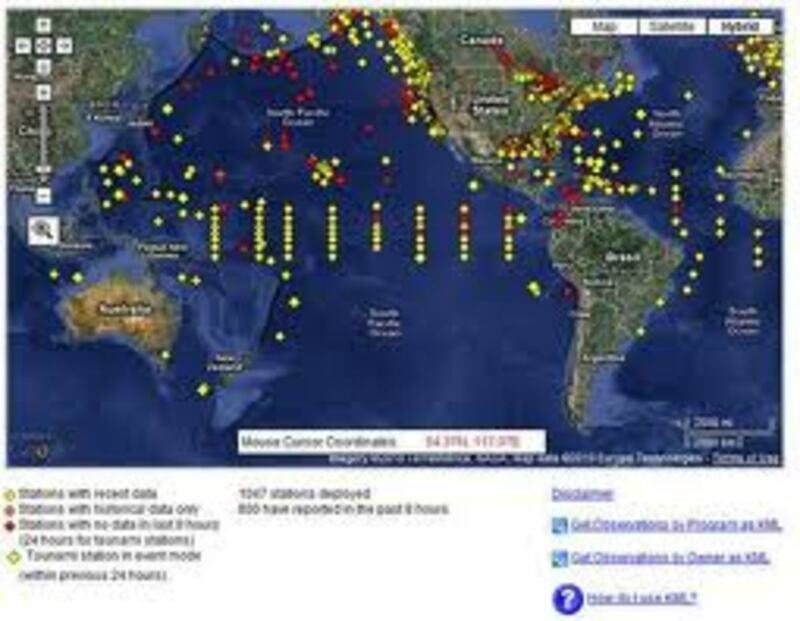 Tsunamis while in deep water are only about 3 feet or 1 metre tall so they are hard to see which is why the buoys scattered around the pacific plate are so important. These are able to measure these waves and this helps to give the Countries and Islands at least some warning of impending danger. 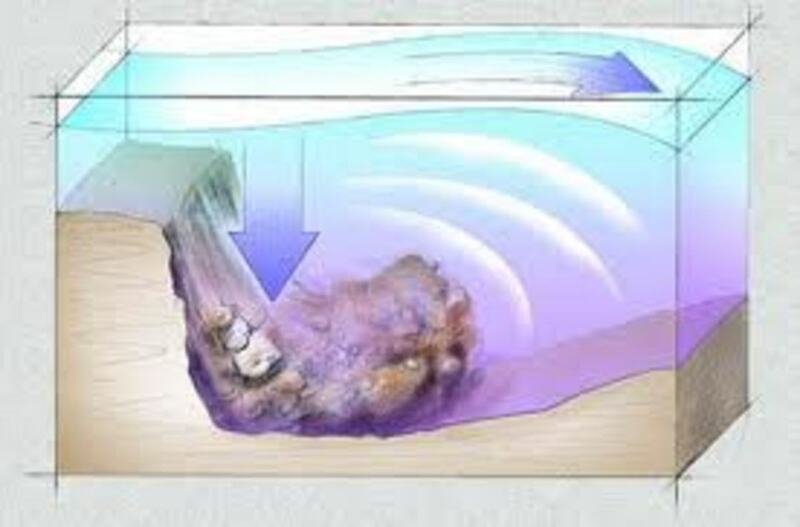 Once a Tsunami reaches shallow water it loses some of its forward speed slowing down to approximately 500kph. 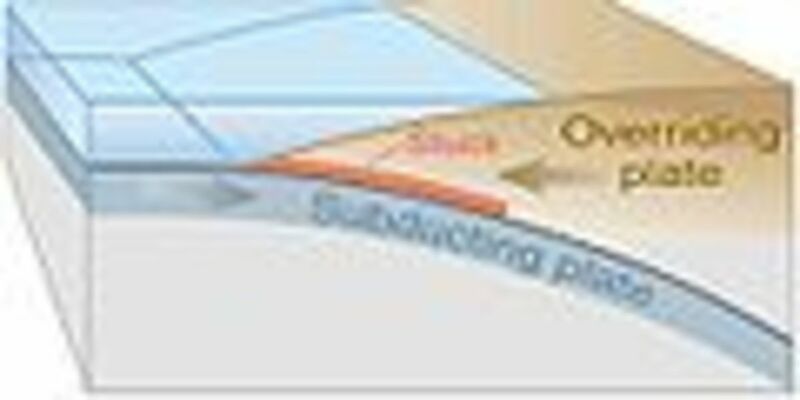 (As the wave reaches the shallow water above a continental shelf, friction with the shelf slows the front of the wave. As the tsunami approaches shore, the trailing waves in the train pile onto the waves in front of them, like a rug crumpled against a wall) This means it's height rises dramatically. This is also why it is so hard to outrun a tsunami. Tsunami waves can be over 98ft or 30m high. Tsunami's churn (literally) cars, homes, trees, boats, piers, concrete and anything else that it can smash and take along with it. (Most people say there is a loud roaring sound similar to a train or aircraft). Tsunamis are made up of many waves. The first wave is not normally the biggest wave. 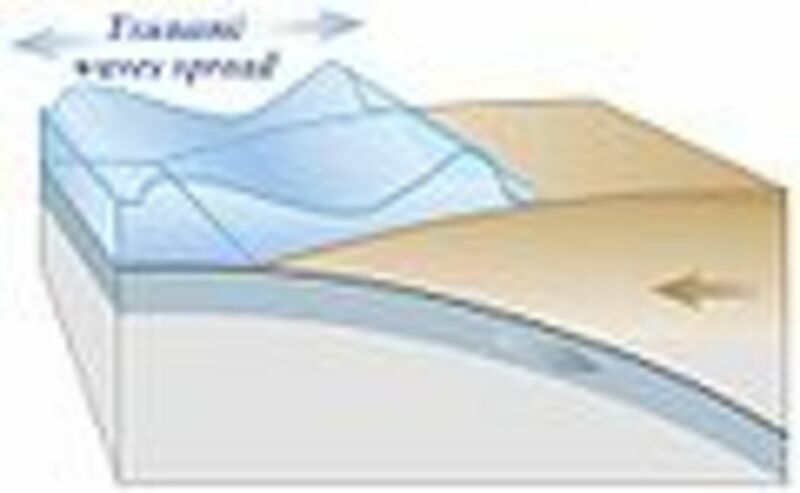 The waves can occur from 2 minutes to an hour apart. A series of Tsunami's waves can last for several hours after the arrival of the first wave. A tsunami can make the water recede badly enough to exposing land which is usually submerged. (a buzzing or sucking type of sound can most times also be heard at this time). If you see and or hear this happen please get to higher ground fast. This doesn't always happen so if you have a tsunami warning in place it's better to be elsewhere and safe than caught in the churn. 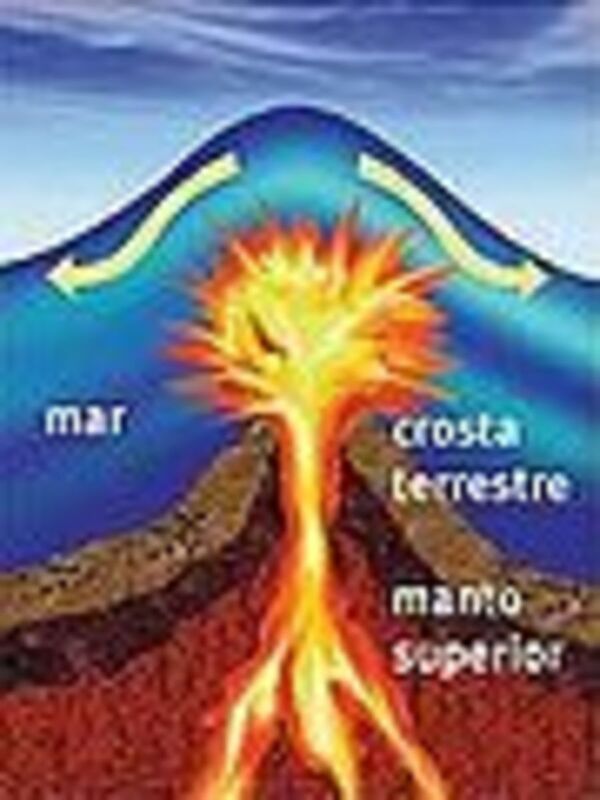 497 B.C Potidea, Greece - A tsunami killed many people. 426 B.C. the Greek historian Thucydides wrote In his book History of the Peloponnesian war comments and queries about tsunami's and stated that ocean earthquakes must be the cause of them. One scientist says ... It's hard to predict but seems to be increasing every year like every other major weather event. Guess he needs to learn how to use database on his computer to compile the results for him so he can give an estimated number. They actually happen many times a year; luckily most of them are no larger than a normal high tide wave because the earthquake that produced them is also very small. 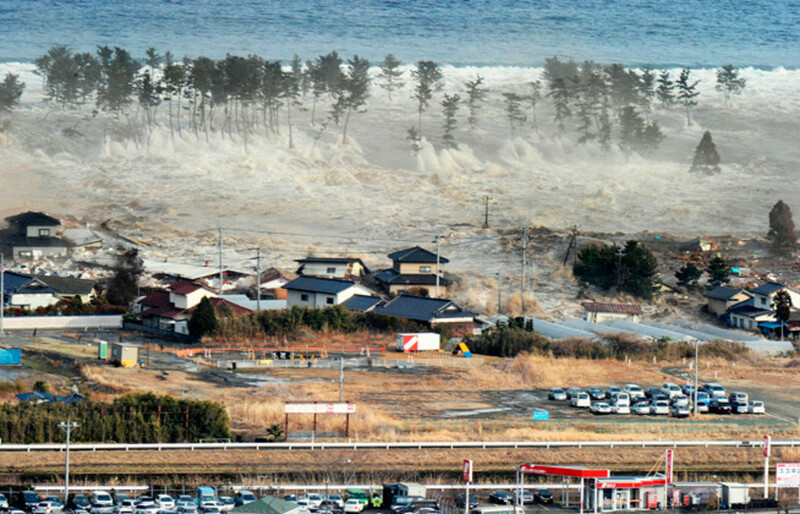 Tsunami's like the one that hit Japan and swept across the Pacific Ocean on Friday only happen about every 15 years. Mega tsunami’s (also called iminami or "purification wave"). Mega tsunami’s have a wave that reaches more than 100 meters (328 feet). 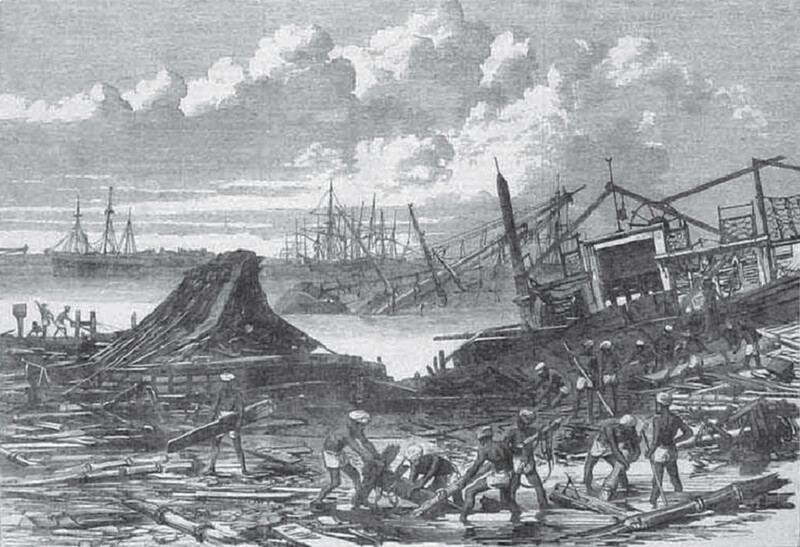 Department of Geography, University of Essen says that … At least 100 mega tsunamis in different parts of the world have been recorded in the past 2000 years. According to a French nuclear safety official, an atoll collapse could trigger a 20-metre wave and expose people on Tureia atoll to radiation levels 300 times higher than in France. Roland Oldham, President of the Nuclear Test Veterans Association, Moruroa e tatou. Said on March 15, 2011 …. One big part of the atoll is under the water. The road you can only drive to a certain limit and the road’s in some places are two metres under the water. And you can see when you look over the sea you can see all these cracks in the coral for a few metres. The atoll has been sinking slowly every year, a few centimetres, maybe 10 centimetres. All the islands of French Polynesia would be mostly concerned if there was a wave of 15 and 20 metres, and worse than that is the leaking of all these poisonous things in Mururoa, radioactivity or whatever or plutonium or gas in the ocean. And from there on it could affect not only French Polynesia, but it could affect the whole Pacific. In World War II, the New Zealand army set off a series of underwater explosions triggering mini-tidal waves at Whangaparaoa in 1944 and 1945. Professor Thomas Leech's work was considered so significant that United States defence chiefs said that if the project had been completed before the end of the war it could have played a role as effective as that of the atom bomb. As a New Zealander this is truly scary. I mean why would anyone want to create something that can cause so much horrific devastation. I must admit that I wasn’t aware of this until a few days ago when I found it by accident. 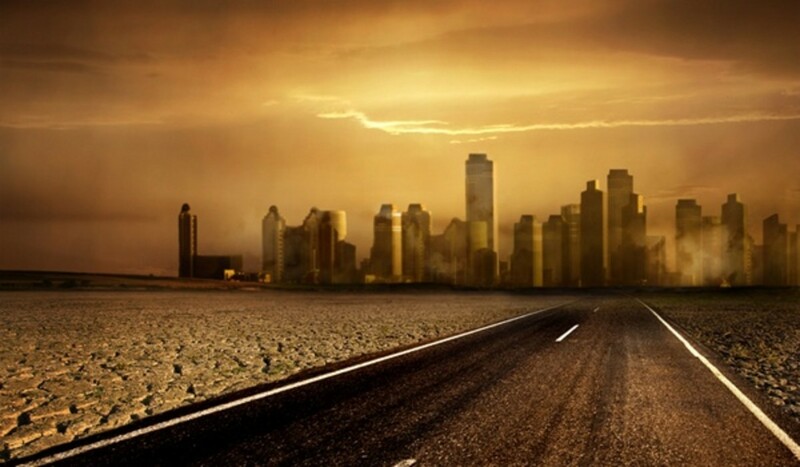 Earthquake Facts: Are the Numbers of Big Earthquakes on the Rise? Interesting and informative hub that answered my question very well. Thanks for sharing the information. This is an interesting and informative hub that is full of fascinating details, Lyn! Thank you for all the information. Thank you for taking the time to give me feedback Gordon Hamilton. I do try to write my hubs so that any age can understand the info I have compiled. It is an amazing subject to learn about though I must admit to being slightly disappointed that scientists in this field don't know more. I kept expecting to find new thought provoking info. Ahh well maybe in a few more years. Firstly, I think you are right, Lyn, in the sense that tsunamis seem to fascinate a great many people. Perhaps it is a wondrous fascination in relation to their awesome power? Whatever, I know the subject fascinates me and that you have covered it in great detail, providing information that is very easy to understand and absorb. Fabulous Hub! Thank you for your kind words and for stopping by HomerMCho. Excellent hub, Lyn. You've got my interest. It seems there is still debate on how high the waves were the news reports vary from 10 metres to 23 metres high and travelled 6 miles inland. they would have gone further but for the hills. I've read that some of the waves that hit Japan were nearly 60 feet high. No wonder so little withstood the force! Feel free to chat or add anything ... I hope this was useful to people.